Rich Christian, Poor Christian: Are You A Possibility Thinker? Perhaps Old Robert Was On To Something? Do you remember dear old Robert Schuller? 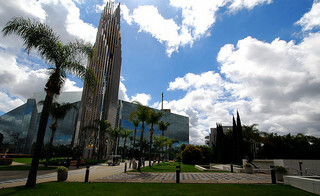 Dr. Schuller is the founder and former pastor of the Crystal Cathedral out in Garden Grove, California. He is also the author of several books such as Move Ahead With Possibility Thinking (1967), Tough Times Never Last but Tough People Do (1983), Life's Not Fair, But God Is Good (1991), and If It's Going to Be, It's up to Me: The Eight Proven Principles of Possibility Thinking (1998). Anyway, several years ago, I recall watching his TV show, "Hour of Power," and hearing Dr. Schuller talk about "possibility thinking." He has always been one of the chief gurus and proponents of the power of positive thinking. His approach is mostly a lot of human self-help, pop psychology with a little bit of Jesus mixed in, in order to make it all Christian-like. But you know, maybe, just maybe, this former Crystal Cathedral pastor has been onto something all along. In Genesis 18, we read the story of the three visitors that come to see Abraham and Sarah. Who are these three visitors? More than likely, one of these men is probably a pre-incarnate appearance of Jesus Christ and He is being accompanied by two of His angels. So, when these three men approach Abraham, we see that Abraham springs into action to give them rest and refreshment. He has Sarah prepare a meal for their three visitors. You get the sense from the beginning of the encounter that Abraham knows exactly who these three men are. After the men have eaten their meal, a discussion begins regarding Sarah. The three men explain to Abraham that over the next year, Sarah will give birth to her first and only child - a son! Sarah's womb has been barren for decades and both Abraham and Sarah were already well along in years. She was definitely well past the normal age of childbearing. In fact, while Sarah was in her tent, she overheard what the men told Abraham. Her reaction: she laughed at the notion of bearing a son at her age! But, these three men called Sarah to account for laughing at their prophetic message. The Lord asked why Sarah laughed at the notion of having a son, and then He asked them "Is anything impossible for the Lord?" (Genesis 18:14). If God wants something to happen, it's going to happen. He is the Creator and Sustainer of all things in the Universe. If He wanted Abraham and Sarah to have a son, then they would have a son. The circumstances of Sarah's older age apparently had zero impact on her being able to bear a child. God worked a physical miracle on Sarah's behalf. God made the impossible possible for both Abraham and Sarah. I don't know where you're at, today. Maybe, you're going through some heartache, some difficult circumstances like Sarah did some 5,000 years ago. Perhaps, you are struggling financially in a difficult economy. Or, your family has completely fallen apart right before your eyes. Maybe you can't land a decent job in order to provide for the physical needs of your family. I have good news for you, today! If God's will and your desires line up, then something will happen. Nothing is impossible for God. Your next question may be, "But how can I know if God's will and my desires line up?" The only way you can know and understand His ways is through being in the Word and in prayer on a consistent, daily basis. Grab onto God's promises in His Word, pray back those promises to Him, and watch Him work in your situation. You may not get the absolute outcome that you're hoping for, but if you are a child of the King, then you will receive the outcome He has for you. Become a possibility thinker in what God can do in your life!